Staghorn ferns grow high in tall trees attached to, but not growing "in" the bark. Stags don't need or use soil as do land plants. They have no flowers. They get their nutrition substantially from the air and therefore in the same class as orchids, for example, which also mostly grow in trees with no soil. There are two kinds of fronds: the green fertile fronds and the brown sterile fronds. 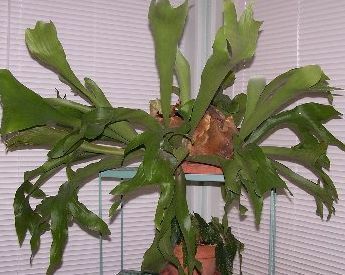 Staghorn ferns are usually mounted on wooden boards. They can also be hung from chains under large trees to form a ball of foliage. Bright light but no direct sun is the best location. Your stag can handle some early morning sun only. They always have a leaf canopy, in the wild producing broken shade. Approximate this condition as best as possible. They don’t like windy conditions. Feed with organic food such as fish emulsion or Garrett Juice. Place a banana peel (peel only) behind the stag, between the stag and the board. They like the potassium. Water about once a week by soaking the moss. Water with rain water if possible.